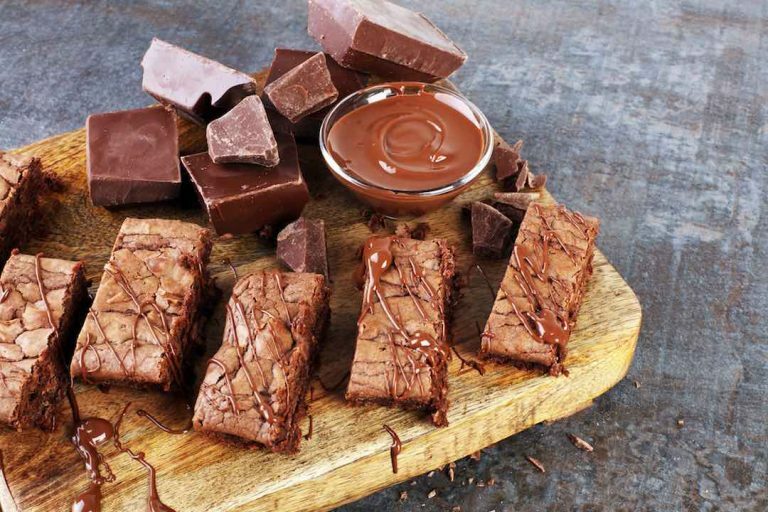 Few people can resist the allure of chocolate. Chocolate, also known as Theobroma Cacao, means food of the gods and has been loved and used by people for at least 2,000 years. Cacao has served as an offering in ancient religious ceremonies, as a medicine, as an aphrodisiac, as a drink for royalty and even as money. Modern man has discovered in part why we have such an affinity for chocolate. It has to do with its effect on our brains. Chocolate contains a variety of mood-altering chemicals, but the ones that are particularly interesting are psychoactive in nature and are phenethylamine, anandamide, theobromine and caffeine. Phenethylamine, also known as PEA is often referred to as the love chemical. PEA boosts production of the hormones dopamine and serotonin, causing one to have an elevated mood and feelings of happiness. PEA has shown promising results at combatting and alleviating depression in several studies. Phenethylamine’s dopamine increase also accounts for an increase in focus and alertness as well as increasing libido and feelings of pleasure. As if PEA wasn’t enough reason to enjoy chocolate, the chemical anandamide is also quite impressive. Anandamide is an endocannabinoid that when produced by the body or consumed, has been linked to lowered anxiety and depression. Theobromine and caffeine act as stimulants and increase both alertness and cognitive function. In addition to the myriad of cognitive boosters, cacao has a variety of other health benefits. Cacao is a good source of magnesium, which is particularly beneficial to bone, heart and colon health. Chocolate also contains cocoa flavanols, which help to lower blood pressure and optimize cholesterol levels, once again making it an ideal heart-healthy food. Cacao is notably one of the highest antioxidant foods, which carries many benefits. Cacao’s antioxidant content helps to slow down ageing, lower risk of heart disease and cancer and reduce inflammation. Studies abound on chocolate and have had promising results such as aiding blood sugar levels and fighting tooth decay. Given how medicinal and beneficial chocolate is (oh yeah, and it tastes amazing), it’s completely worth adding to your daily diet. Before scarfing down that delicious piece of vegan cake, it’s important to get to know the many forms of chocolate and how to use them to reap the benefits. The least processed form of chocolate you can find, the beans and their broken-down pieces, nibs are what all chocolate starts out as. Cacao beans and nibs are not always but usually found in their raw, or uncooked form. These are an ideal way to reap all the health benefits and are perfect for blending into smoothies, adding a crunchy topping to smoothie bowls or ice cream, or baking into desserts. Cacao is often meant to refer to the raw form of chocolate. So cacao powder is usually found to be the unheated, unroasted powder that has been pressed from the bean. Cacao powder is a high-quality alternative to the beans and nibs and is perfect for use in smoothies, raw desserts and cooked desserts. The term cocoa often is used in reference to the powder of roasted cocoa beans. This powder comes in two forms, natural and Dutch processed. The natural form is more bitter but contains far more antioxidants and phytonutrients. The Dutch processed, which will appear on the label, is a less bitter product that some people prefer for its taste. Cocoa powder can be used in hot chocolate, smoothies and bakes up fantastically in desserts. Chocolate in bar form or chip form is how many people become acquainted with this food. It consists of a mixture of any number of the following: cocoa butter, cacao beans, chocolate liquor and a sweetener. Not all chocolate bars are created equally, and the rule tends to be that 70% dark chocolate and higher is best for the benefits. 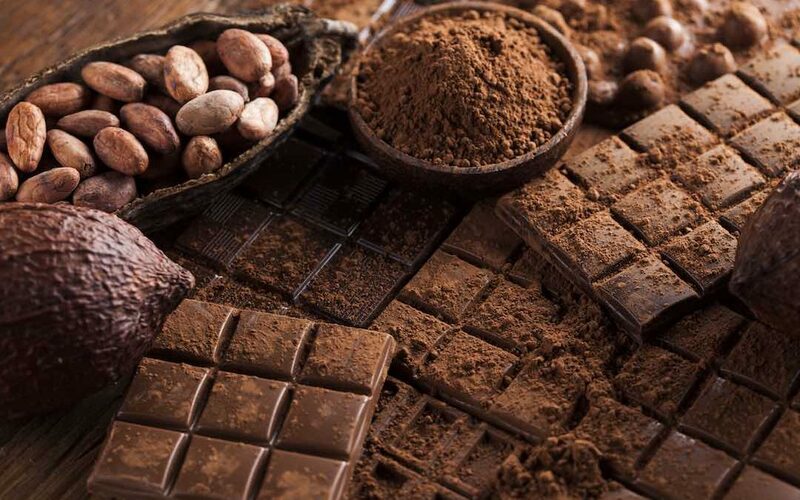 While almost all chocolate bars on the market are made from roasted cacao beans, there are several varieties listed as raw, that have not been heated. These raw bars have a more intense flavor and more nutrients and are worth trying if you can find them. Now that you are equipped with the knowledge of chocolate’s benefits and its many forms, the fun part comes in, eating it! Chocolate can have a place in your everyday life and here are ten easy vegan chocolate recipes to satisfy your chocolate cravings. This decadent fudge uses calcium-rich tahini and mineral-rich maple syrup, making it a healthy alternative to traditionally processed fudge. In a bowl mix together all ingredients except the chocolate chips. Once fudge is well mixed, pour into a parchment lined loaf pan and freeze for 2 hours minimum. Melt down the chocolate chips in a double boiler and drizzle over fudge once it is frozen. This creamy pudding tastes indulgent while also supplying fiber, vitamin K, and folate. In a food processor or high-speed blender add all ingredients except for the cacao nibs and white mulberries, and blend until smooth. Spoon mixture into bowls and top each with cacao nibs and dried mulberries. This delectable recipe uses the root vegetable cassava in place of flour, making it gluten and grain free. Preheat oven to 400 degrees. In a bowl mix together cassava flour and baking soda. In a separate bowl mix together vanilla flavoring, coconut oil, maple syrup, almond butter and water. Add wet and dry ingredients together and mix well, then add in chocolate chips. Scoop cookies with a one-inch scoop or form into roughly one-inch balls and flatten. Place cookies about two inches apart on a cookie sheet. Bake for 8 minutes or until light golden brown. 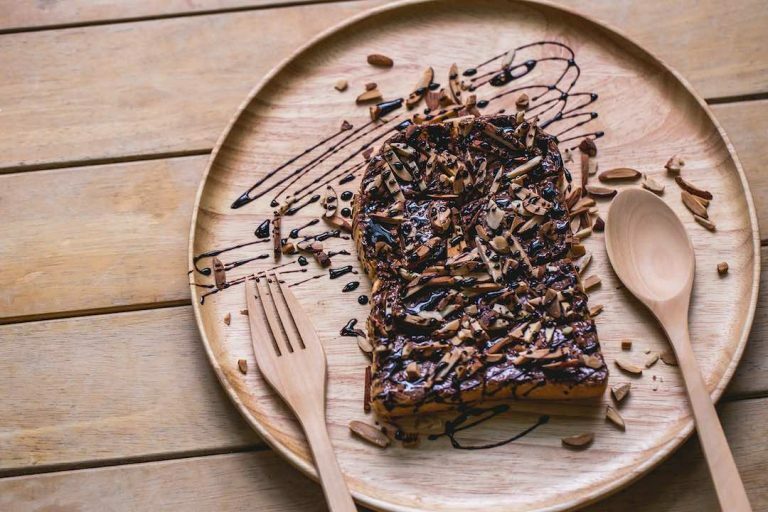 This quick and easy toast offers a double boost of chocolate plus protein making it an ideal morning fuel when your brain needs a boost for the day! Toast bread until golden. Spread half of almond butter on each slice immediately after toasting. While the bread is still warm, sprinkle half of chocolate chips on each piece so they melt a little. Sprinkle cacao nibs on each piece and bliss out! This creamy smoothie is like the world’s healthiest milkshake. The raw hemp seeds provide protein and omega 3’s, the spirulina has powerful antioxidants and the goji berries promote longevity. These benefits combined with cacao and potassium-rich coconut water make one powerful smoothie. Add all ingredients to a highspeed blender and blend until smooth and creamy. This delicious cake from Dreena Burton is minimally processed and sneaks in sweet potatoes! Sweet potatoes are high in fiber and vitamin A, making this one cake you can feel great about enjoying. From the blog The First Mess, this take on hot chocolate is not to be missed! Using creamy coconut milk and dates in place of sugar, it’s a definite staple, regardless of the weather. The Beaming Baker has created the most fudgy and amazing brownies! If you’re going to eat an entire batch of brownies in two days, it might as well be full of healthy fats and antioxidants and free of refined sugar. Detoxinista shares a simple, six-ingredient recipe that will have you moaning with delight and you will never again miss those store bought ones! Oh She Glows chocolate bark is super simple and can be easily modified for endless possibilities. Try to make a few batches to keep in the freezer if you can manage not to eat it all in days. Consuming chocolate daily can be as simple as a morning smoothie or as elaborate as an afternoon hot cacao with cake ritual. Cacao has long been a part of human history and based on current trends, it will remain a part of it for years to come.